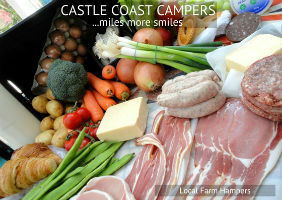 Welcome to Castle Coast Campers – the home of Glampervanning! 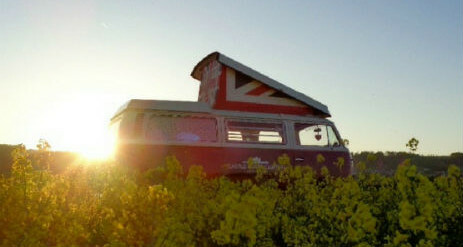 We offer vintage VW Campervan Holidays, Honeymoons, Naughty Weekends and General Times of Loveliness across Yorkshire, County Durham, Northumberland, Cumbria, The Lake District and the Scottish Borders. 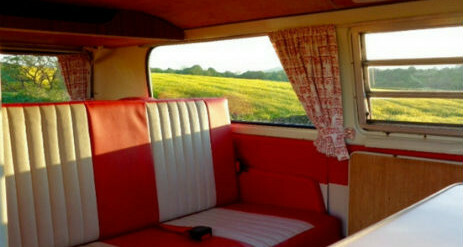 Our beautifully restored original VW Campervans have been given makeovers other Campers can only dream about. 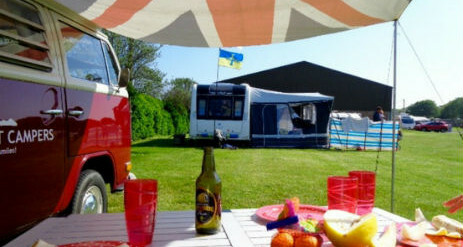 Their Union Jack poptops were custom made by the last sail makers on the banks of the River Tyne and their curtain material was commissioned from fabric and clothing designer Marc Doyle, who even matched the colours to their paintwork! There are no other Campervans in the world quite like our Tilly and Miss Scarlett! 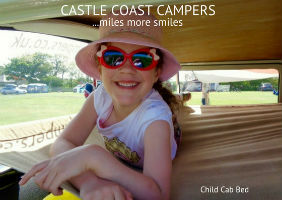 Castle Coast Campers is a family run business based in the small village of Hart in the County Durham/North Yorkshire borders, ideally placed for starting your adventure – you get miles more smiles in a Castle Coast Campervan! We designed our business with our young daughter in mind, so our vehicles are not the ‘standard’ specification campervans available elsewhere. As well as being beautifully restored classic VW Campervans, our Campervans are ‘family’ models – they have a double bed for 2 adults in the back, an enclosed bed for 2 children or 1 adult in the roof and an optional child (from age 3 to approx age 7) bed in the front. 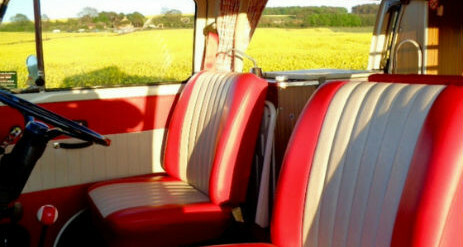 We have also upgraded our Campervans from their original 1970s specification so that they now have modern seat belts to all seats (making them safer and suitable for most makes of child seats), they are fully insulated with non-itch eco insulation, have automatic engine bay fire suppression systems fitted (as used in racing cars) as well as interior smoke and carbon monoxide detectors, fire blanket, fire extinguisher and full first aid kit. They are also kitted out with a twin screen DVD player, i-pod/smartphone friendly CD player and tuner and, of course, they also come fully equipped with all the camping equipment you might need! Miss Scarlett is our classic early 1972 VW T2 Westfalia Campmobile Campervan, in immaculate two-tone Chianti Red and Pastel White; the top of the range model in the early 70’s. Having lived most of her life in America, she has been converted to right hand drive (so the steering wheel is on the correct side!) and seats four in comfort. She was fully restored in 2013-2014, had a full mechanical overhaul and engine rebuild in 2018 and has had modern safety and comfort upgrades to bring her up to the high standards required to become a Castle Coast Camper; and is fantastic fun to drive and a real head turner! Tilly is our classic late 1972 VW T2 Twin Slider Westfalia Campmobile Campervan, in a lovely two-tone Sea Green and Pastel White; the top of the range model in the early 70’s. An Australian Taxi in another life, she is right hand drive (so the steering wheel is on the correct side!) and seats five in comfort, retaining her original rare third front seat. She was fully restored in 2014, had a full mechanical overhaul, rewire and an engine rebuild in 2018 and has had modern safety and comfort upgrades to bring her up to the high standards required to become a Castle Coast Camper. Tilly is fantastic fun to drive and attracts attention wherever she goes! Our gorgeous Vintage VW Campers are available to hire all year round and we advise you book early for popular times such as school holidays and Bank Holidays, or if you are planning to celebrate a special occasion and need a specific date. Something else required? Please ask. Personal luggage and towels, bedding (sleeping bag or duvet, pillow), toiletries and your biggest SMILE! EXPLORE YORKSHIRE, COUNTY DURHAM, CUMBRIA AND NORTHUMBERLAND. There are a huge variety of campsites across County Durham, Cumbria, Northumberland and Yorkshire along with plenty of activities to do and places to see. We think this area is England’s best-kept secret; magical places filled with ancient castles, hidden gardens, pristine coastline, rolling hills, rugged moorland, sweeping views, friendly little market towns and villages and a cultural heritage all of their own. Enjoy the four stunning, enormous National Parks that are within easy reach of our depot – North York Moors, Yorkshire Dales, Northumberland and the Lake District – the magical moors, ancient woodlands, pretty stone villages, the star scattered, clear dark night time skies, the breath-taking coast of sky-scraping cliffs and vast empty sandy beaches; England’s most clean, uncongested, tranquil and spacious region – a week just isn’t long enough to make the most of all that our beautiful counties have to offer! Our Campervans are also available for special occasions, such as Proms and Weddings, and film and media hire – please contact us to discuss your needs. PRICES HELD FOR ANOTHER YEAR! New for 2018 Picnic Days £199 – pick your Camper up in the morning and bring it back in the evening after enjoying the included picnic for two wherever your heart took you! Makes a great gift for a Birthday, Anniversary, Mothers or Fathers Day or just to say ‘I love you’! New For 2018: Flexible Rate Budget Plan – pay for this years, or next years, holiday in easy monthly instalments. You can park your car at Castle Coast HQ at no extra cost – we are located in a quiet village and our car park has CCTV. We can help you plan your escape; sharing our teams expert local knowledge of the best places to go, the best sites to stay overnight at and the best places to enjoy the Norths famous, friendly welcome and great food …and the odd beverage or two! Whether you are looking for a romantic break for two, a full on active outdoor adventure with friends or a fantastic family getaway all about the kids, we can help you get miles more smiles! Quote ‘Love Glamping’ to get this offer. 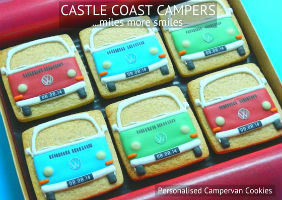 Campervan Hire Vouchers – the ideal gift! 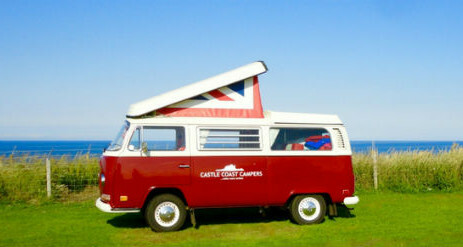 Buy someone a Campervan holiday gift voucher for £50 or more and we will add £50 to the value. Alternatively, we will give you a second voucher for £50. Shhh! We won’t tell anyone! Gift Vouchers are valid for 2 years. Gift Vouchers can either be posted (traditional full colour printed card) or emailed (e-voucher). Post free to UK addresses. Only one special offer voucher can be applied to each booking. Quote ‘Love Glamping Gift’ to get this offer.